Harrison, R.A. 1952: New Zealand Drosophilidae (Diptera) I—Introduction and descriptions of domestic species of the genus Drosophila Fallén. Transactions of the Royal Society of New Zealand, 79: 505–517, plates 97-99. Meigen, J. 1830. Systematische Beschreibung der bekannten europäischen zweiflügeligen Insekten 6, iii–xi + 1–401 + 24 unnumbered pages. Hamm, Schulzische Buchhandlung. BHL Reference page. 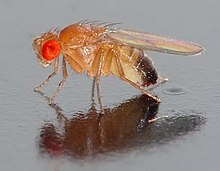 For more multimedia, look at Drosophila melanogaster on Wikimedia Commons. This page was last edited on 8 March 2019, at 07:51.